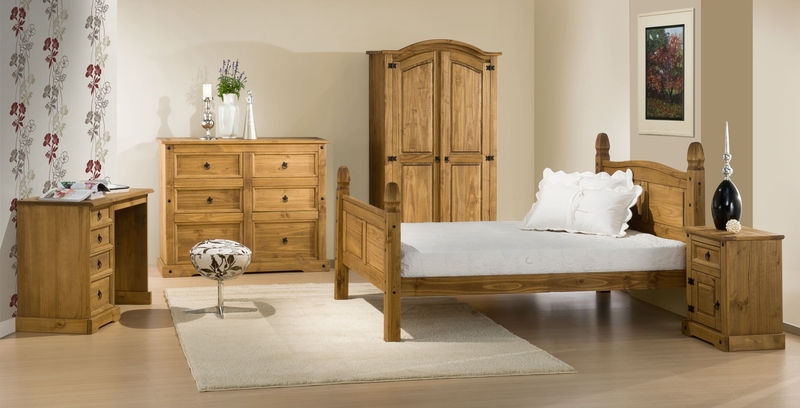 The Corona range of bedroom furniture has a huge variety making sure that you can have the right pieces of furniture for your needs and your bedroom. The whole range is superbly constructed from solid pine to give it a very stong and sturdy feel. The pieces in the collection range from storage chests to large wardrobes including a 4 door wardrobe. If space is an issue there are the narrow drawers and smaller 2 door wardrobes that will suit. All the drawers on every item of furniture pull out smoothly on the runners. The black door hinges, handles and stud details look great against the distressed pine wooden fronts. A Low foot end bed and a high foot end bed are available in the same collection to give you that great matching feeling. Тhe Corona pine collection is supplied flat packed but all come with very clear and easy to follow assembly instructions.